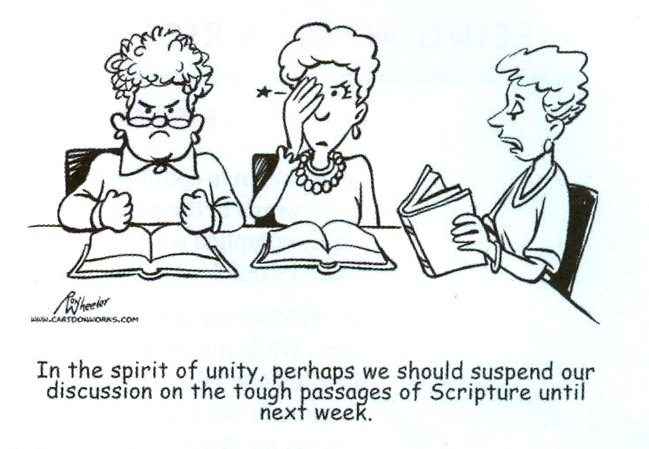 Without a teaching authority or the tradition of the historic Church, this cartoon shows what many Bible studies are really like. I remember Bible Studies that started out with “What does this passage mean to you?” To keep from arguing or fighting, many just avoid difficult passages. There are many studies that exclude Catholic ideas and comments and the reason Catholics are invited is with the hope of converting them. What matters is this – what did author intend in the context of his own time and how has the Church understood it for 2,000 years!